Boston College Professor of Political Science David Deese is the editor of Handbook of the International Political Economy of Trade, which brings together leading researchers and writers from different countries to highlight the most important and promising research and policy questions regarding international trade from the past decade. 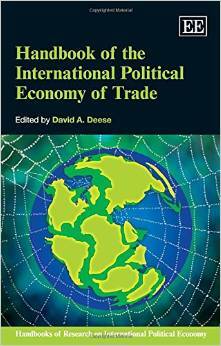 The book looks at the topic from the disciplines of political science, political economy, law and economics. Deese talked about the book in this BC Libraries video. This entry was posted in Boston College Authors and tagged BC Libraries, business, Political Science department, politics. Bookmark the permalink.